Watch with amusement as Fred Conlon's crafty critters carry away a kitschy intruder from your garden. 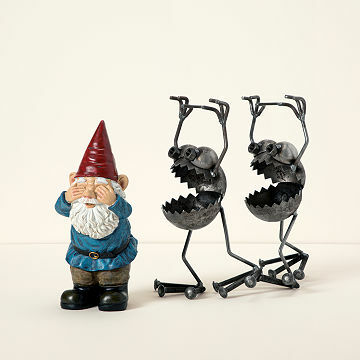 Watch with amusement as the one and only Gnome-Be-Gone frees your garden of a kitsch little Euro invader. Who does he think he is, wearing tiny red dunce caps and pushing inefficient wooden wheelbarrows? Tuck a few made-in-the-USA Gnome-Be-Gones into your flowerbeds and watch the demented yard goblins get toted away. Set includes one gnome and two Gnome-Be-Gones. Designed by Fred Conlon. This item is intentionally designed by Fred Conlon to develop a rust patina outdoors. If the rust is not desirable, the artist recommends a clear spray paint like rust oleum or krylon. Gnome is resin, unattached and may vary.Please note: this item contains sharp parts and is not intended for children or pets. I did put a clear coat on it to keep it from rusting. I will keep it out of the hot Florida sun when we head south for the winter to keep the gnome from fading. I simply enjoy it and am glad I bought the larger one. This item is sure to get some hilarious comments and will be an object of amusement for everyone who sees it. They are a piece of art, clever and fun to look at. My daughter bought me the flamingo be-gone so I HAD to get the rest in the line. Have the gnomes be gone and the dragon fly piece - love them.. This was a birthday gift for my daughter. She loved it! It is a weighty piece, I was surprised by that, and I'm sure she will enjoy it for years to come. Cute and unusual. I like things that are different from regular garden art. After reading other reviews I bought some clear sealant today to hopefully make the art last for years.